Currently viewing the tag: "Woodworking"
This cast-iron chisel holder from Veritas converts a 1″ beveled edge chisel into a rabbet or shoulder plane. The 1-3/8″ wide by 5-1/2″ long by 2-1/2″ high chisel holder grips the chisel at a 45º angle with a solid brass thumbscrew. 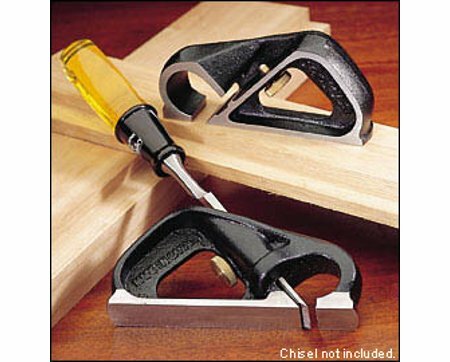 Once the chisel is properly seated, you can use it to clean up rabbets, tenons, and hinge recesses or cut 1″ wide grooves and dadoes up to 3/8″ deep. 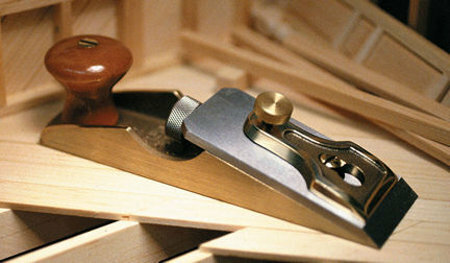 Made in Canada, the Veritas chisel plane will run you $50 before shipping. 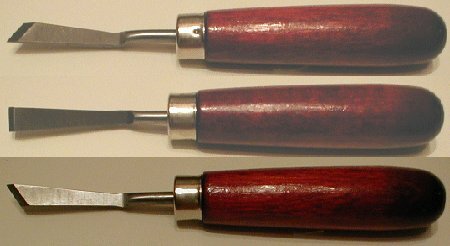 Made in Japan and sold by Lee Valley, these finger files allow you to shape wood in tight places, and being smaller than a full-sized file, they might offer a bit more control. The coated stainless steel files have a medium-fine tooth pattern that can cut quickly and evenly in all directions, yet still leave a smooth finish. The edges of the files don’t have teeth, so you’ll only remove the material you want. Forget about your file card too; these files supposedly resist clogging. When using a router table, you want the throat — the opening the bit pokes through — to be the smallest diameter possible that still allows the router bit to turn freely. If the opening is too large, small pieces can dip or even fall into the throat. Some throat plates twist and lock into place, and others are held in place by screws, but by far the coolest way to hold a router throat plate is with magnets. INCRA’s MagnaLOCK laser cut steel rings are held in place with four rare earth magnets; just drop the right-sized ring in place and you’re ready to route. 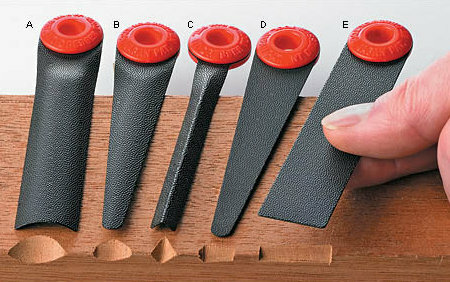 The donut-shaped magnets are held in place with counter-sunk screws and sit on top of O-rings. This setup presumably allows you to adjust the height of the rings so that they’re flush to the table surface. 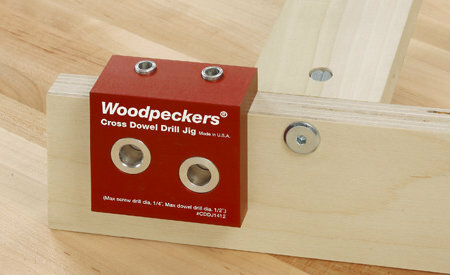 Add one more to the list of red-anodized aluminum tools you just have to own: the cross dowel jig. Cross dowels are used in assemble-it-yourself furniture that you might find in stores like Ikea. They create a really strong joint because you are mating a bolt with another piece of metal rather then threading into plywood or particle board. Need to undercut a groove or mortise? To paraphrase Apple: “There’s a tool for that.” The 1-1/4″ long blades of these dog leg chisels from U. J. Ramelson are offset from the handle and tapered from front to back to fit into places other chisels can’t reach. 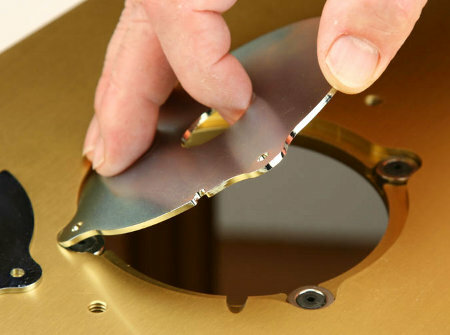 FastCap, a company started for making adhesive screw cap covers, also has a kit that lets you make your own covers out of .018″ to .022″ thick edge banding or veneer, but they don’t recommend plastic laminate. To make your own covers, apply the speed tape to the back of the veneer. Then, with the right size die in the hole punch tool, punch out the covers from the veneer. 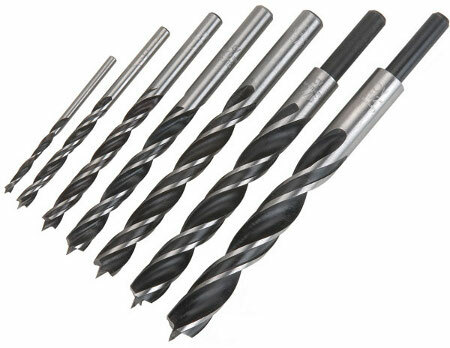 Now you have covers that will fit perfectly into the counter bores created by FastCaps Flush Mount Drill System. Where do you put your glue-ups? On the floor where you might trip over them? On your bench so you have to wait for it to dry before you can be productive again? 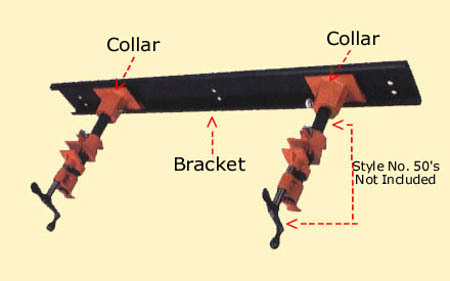 Pony Mounted Clamp Collars let you mount glue-ups on the wall and out of the way, freeing up space to get more done. 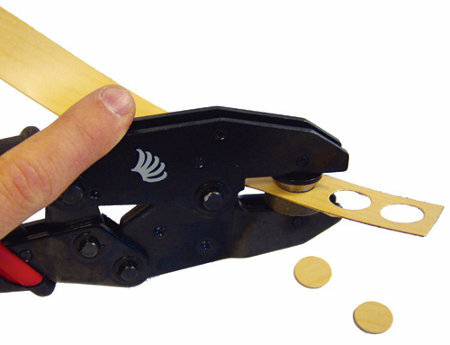 Used for 3/4″ pipe clamps, the collars slide into a bracket that you mount on the wall. 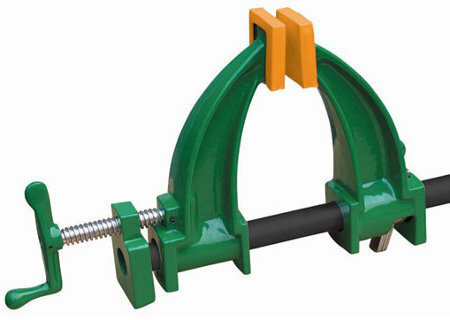 The free ends of the pipe clamps slide into the collar and are secured with thumbscrews. Since the pipe clamps are hanging from the wall, you need to be careful about how much weight you put on the clamps. They recommend no more that 200 lbs. on 3-foot long pipe clamps, though I’m not sure if that’s for a single pipe clamp or two.